Save your favorite bottle of wine with these natural wine corks. Each package contains 200 corks to ensure you never run out of supply. There are 3 unique grape vine designs; each cork is imprinted with one of them. This set contains 200 wine corks to ensure you never run out of supply. Each cork has a vintage grape vine design imprinted on them. These corks should be inserted using a floor corker. These corks are non-toxic and manufactured from real cork to guarantee safe use. No synthetic chemicals were used in their design, ensuring that these corks won't change the taste of your wine. All corks are non-recycled and brand new. Ready for use, straight out of the box! 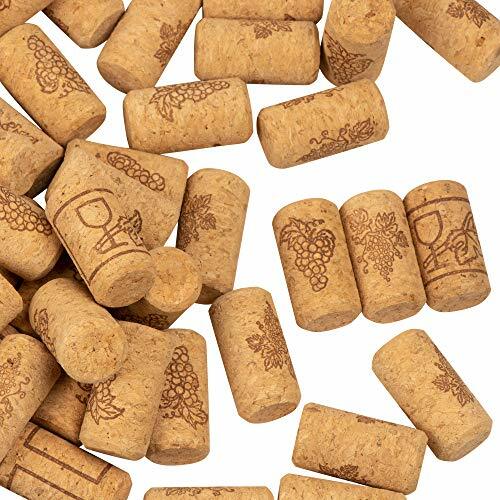 These corks are straight with a non-tapered design that fits most average wine bottles. Dimensions: Each cork has a diameter of 0.93 inches and a height of 1.7 inches. SET OF 200 BULK WINE CORKS: This set contains 200 wine corks to ensure you never run out of supply. Each cork has a vintage grape vine design imprinted on them. These corks should be inserted using a floor corker. NON-TOXIC, REAL CORK: These corks are non-toxic and manufactured from real cork to guarantee safe use. No synthetic chemicals were used in their design, ensuring that these corks won't change the taste of your wine. NEW CORKS: All corks are non-recycled and brand new. Ready for use, straight out of the box! STANDARD SIZE: These corks are straight with a non-tapered design that fits most average wine bottles. DIMENSIONS: Each cork has a diameter of 0.93 inches and a height of 1.7 inches.